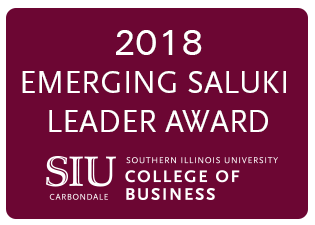 The College of Business will present the 2018 Emerging Saluki Leader Award (ESLA) to three exceptional recent alumni on May 4. These awardees are being recognized for their outstanding achievements in business, academia, government, not-for-profit organizations or community service. Nicole Cundiff is a triple alumnus of SIU. She earned a Master of Business Administration in 2005, a master’s degree in applied experimental psychology in 2007 and a doctorate in applied psychology in 2010. She is currently the director for the business administration program and an associate professor for the School of Management at the University of Alaska Fairbanks (UAF). Cundiff is largely responsible for setting the direction and operation for the Business Administration program. During the course of her career, Cundiff served as the director of a statewide leadership center for five years, was involved in youth leadership development programs and was the 2014 Chancellor’s Innovation in and eLearning Fellow. She also was named one of the “Alaska Journal of Commerce’s” Top 40 under 40 award winners in 2015. Cundiff’s civic engagement involves serving as the associate editor for the “Journal of Leadership in Management,” being a co-founder and member of the Lion’s Club in Fairbanks, and serving as a UAF Faculty Senate School of Management representative. In addition, she volunteers her time with the Pride Foundation, the Boy’s and Girl’s Club, the Human Rights Campaign, the Golden Heart 100+ Women that Care, Mission of Mercy and Alaskans Together for Equality. A single mother of two, Cundiff today appreciates the support she received as an SIU student. “I believe that being a Saluki is synonymous with being empowered, informed, supported, connected and engaged,” Cundiff said. “As a young single mother it took me roughly 13 years to become a quadruple alumna, which I could not have done successfully on my own. It took the support of many wonderful faculty and staff to educate, develop, encourage, and motive me along the way.” She attributes a big part of who she is today to this university. “I am proud to be a Saluki and will always consider Southern Illinois University Carbondale my home,” she added. Clayton Pryor also earned the award. He received his bachelor’s in management degree at SIU in 2006. He subsequently completed his master’s degree in organizational leadership at Lewis University in Joliet. Today, Pryor lives in Chicago and works as the director of workforce development for Advocate Health Care. He is responsible for managing a multimillion-dollar portfolio which is dedicated to creating a pipeline of prepared candidates for the healthcare industry by offering job skills and investment training in under-served communities. During his early career, he was already recognized as an emerging leader by the National Urban League. He led a diversity effort expansion for the CTA Red Line Renewal Project which exceeded inclusion goals. He also managed an annual $6 million Transportation Construction Trade training program, funded by the state of Illinois. Pryor continues to be involved with his alma mater, serving as a board member for the CoB Office of Diversity and Inclusion and is a mentor for current CoB students. In addition, Pryor supports and volunteers his time with Big Brothers Big Sisters, the IDeaL Education Foundation and Alpha Phi Alpha Fraternity, Inc.
A first generation college student, Pryor credits many of his professional achievements to the skills that SIU helped him develop. “I’ve carried those moments with me over a decade and am truly grateful for my experience, the lifelong friends and the diverse network that have helped me navigate throughout my career,” he said. Ranie Atwood Verby, a double alumnus of SIU, is the final recipient of the 2018 Emerging Saluki Leaders award. She earned her bachelor’s degree in accounting in 2002 and her Master of Accountancy in 2003. She is currently a financial advisor for the Moneta Group in St. Louis, Mo. and is certified as both a public accountant and a financial planner. She supports the arts, serving as an associate board member and vice president of recruitment for the Center of Creative Arts (COCA), whose mission is to enrich lives and build community through dance, vocal music, theatre, art and design. Verby is also a member of the Women’s Investment Network (WIN), which advocates for the financial literacy of women to help them achieve their financial goals. A member of the College of Business Accountancy Alumni Advisory Board, Verby still finds time to give back to SIU. She assisted Marcus Odom, professor of accountancy, in establishing the original associate board. She also played a significant role in reinstating the CPA review course, which she felt helped her pass the exam on her first try. Originally from Marion, Verby is a first-generation college student who demonstrates the Saluki spirit in all she does. “I’m the first person from my family to go to college. I have often thought about how fortunate I am to be able to work alongside people from top schools nationwide,” she said. Nominations for the Emerging Saluki Leader award are accepted year-round. You can submit a nomination or learn more about the award and ceremony at www.business.siu.edu/about/saluki-leader/.